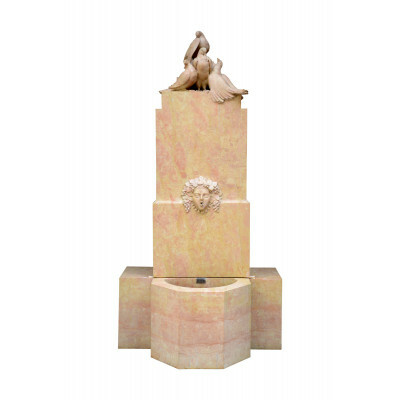 Dating from 1930, Art Deco fountain in Burgundy stone, by Vadim Androusov (1895-1975) and André Arbus (1903-1969). Vadim Androusov and André Arbus, sculptors but also architects and decorators, have often collaborated together for twenty years. From this long collaboration were born a large number of pieces of furniture. "Vadim Androusov chiseled his taste for the technique and the materialization of human spirituality alongside his father geologist and his grandfather, the archaeologist Schliemann.After wandering in Europe, he finally set up his studio in Paris in 1920 and followed the lessons of "La Grande Chaumière" given by Bourdelle. His first sculptures date from 1925 and represent female figures or characters inspired by Antiquity. Using little bronze Androusov preferred terracotta, plaster, wood or stone. He exhibited his achievements at the Salon des Tuileries and Salon des Independants and ran a parallel activity as ornamental decorator-abounding. Wall sconces, furniture handles, keyholes through Medusa's heads or lions; the original creations of the artist embellish the most beautiful neoclassical pieces of Arbus and Pascaud. "( Marcilhac Gallery website). "Born into a family of cabinetmakers, André Arbus studied at the Ecole des Beaux-Arts, while working in the paternal workshop in Toulouse. Once his studies ended, Arbus succeeded his father in the company family, of which he becomes the artistic director. Since 1925, Arbus regularly participates in salons in Paris: Salon des Artistes Décorateurs, Salon d'Automne and especially at the Exhibition of Decorative Arts, by sending various pieces of furniture, as soon as noticed and appreciated by critics. In 1930, André Arbus regularly exhibits his creations in the very young L'Epoque gallery in Paris, alongside the sculptor Vadim Androusov and the painter Marc Saint-Saëns, until its closure in 1932, when Arbus decided to move to Paris . He is considered, at 30, as the "leader of the return to the French tradition and quality", inspired by Louis XVI and Directoire styles, to which he will remain faithful throughout his career. André Arbus is therefore naturally inspired by traditional manufacturing techniques by associating them with more modern and less ornamented pieces of furniture. Thanks to this new status and its respect for the cabinetmaking, the lacquer is imposed on him in a natural way. From his first realizations, he regularly lacquered certain pieces, allowing him to combine tradition and modernity once again. The journalist Bernard Champigneulle says about him that "He knew how to realize this alliance demanded by Baudelaire for any art movement between an eternal and invariable element of beauty and a circumstantial and variable element that depends on the fashion and the 'epoch' (Chastel Maréchal Gallery website). The fountain resumes the very straight lines of the Art Deco style of the 1930s. It is surmounted by a carved group of 4 pigeons. A mascaron representing a woman's head can feed the fountain with water. His face is surrounded by a crown of grape leaves and bunches of grapes. Small restorations.